One night after returning from Taipei, I went back to Narita. This time I departed for Dubai. The airplane I boarded at Narita was the same A380 aircraft that I rode the other day when I returned from Dubai, in "Taking a shower 12,000 meters up in the sky". This time I flew in business class. Both business and first class were fully booked. Many of the people on board, like myself, are participating in the Global Agenda Council (GAC) of the World Economic Forum (WEF). There were many who I know well, including Dr Yoko Ishikura. We arrived in the early morning and checked in Jumeira Al Qasr. This time, the WEF-GAC seems to have increased the number of participants by around 20 percent. With over 80 Councils, there are more than before　and many new innovations were put into place to ensure everything was running smoothly. This increase signifies the growing number of issues which the world is facing. There are separate Councils for around ten countries, one of which is Japan. I am chair of the Japan Council and the people on this council are mostly Japanese. Several meetings have already been held in Tokyo, so the issues on the table were relatively hashed out even before we started. However, in recent years, there seems to be few positive messages about Japan to communicate and consequently there were few visitors. Nevertheless, it is my role to greet the people who stop by, and therefore I spent much of my time at the Japan Council. Sadly, there weren’t many people who visited. It seems that the attention given to Japan and the expectations for the country are lacking and lukewarm. However, the nuclear accident at Fukushima is a different story. Regarding the National Diet of Japan Fukushima Nuclear Accident Independent Investigation Commission (NAIIC), we received many questions, mostly on the individual level. In these past two or three years, I have talked often with the chairs of the China Council and the Korea Council but as both councils had new chairs this time, it was a very important moment and we discussed and shared many things. Both were quite frank and highly aware of the need for greater exchange on multiple levels. We were able to have many fruitful discussions. Just as I was thinking that it is a time of change for leaders in both China and South Korea, the news broke that the Japanese Lower House will be dissolved. It is quite a time. 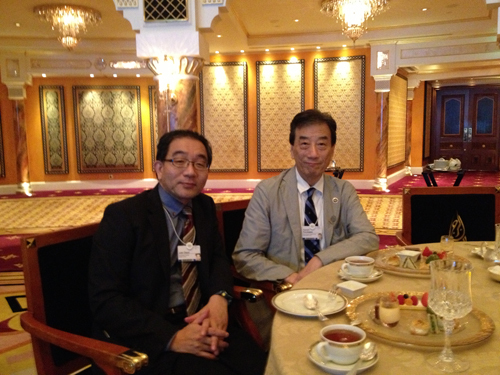 As I was talking with the South Korean chair, Dr Guen Lee, it became clear that his father is someone whom I know well. Dr Guen Lee is the son of Professor Lee (Ho-Wang), the former chairman of the Korean Academy of Sciences (KAS). I have a photograph together with the father on this blog. It was meeting Professor Lee that brought me to Professor Ju and has fostered the continuing, inspiring advances in Japanese and Korean medical history (1, 2, 3) . At the top is a photograph taken with Dr Guen Lee at the banquet on the 26th floor of the famous Burj Al Arab. When I returned to Japan, I received an email from Dr Lee saying that his father was delighted. The coincidences that can occur in the network of people is a fascinating thing. I have given my views on the National Diet of Japan Fukushima Nuclear Accident Independent Investigation Commission (NAIIC) numerous times on this blog and in many other media. If Japan does not learn from the lessons of Fukushima nor change the many systematic problems of Japanese society, I believe that it is inevitable for this country to sink. My views on this can be found in the article, “Japan will Sink if it Does not Change Now” (English translation) which was run on October 11 in the Sankei Shinbun newspaper. My opinion is also in the recent article “Self-Approved Personnel and the Return of Rule by the Nuclear Village” (English translation) which was run in the Tokyo Shinbun newspaper (and the Chunichi Shinbun) on November 8. Post-Fukushima, it is difficult to tell what will be the future of Japan’s accident response, the direction of the energy policy and nuclear power, the new nuclear power regulatory committee, the processing of spent fuel rods, and other such discussions and policies regarding nuclear power. Further, it seems that the nuclear power issues are being dealt with in a cloud of opaqueness and ambiguity. As usual, the ideas are short sighted and there is low transparency. What are your views on this matter? The main message of our NAIIC report is that regarding these nuclear issues, the Diet, which is the legislative branch, must keep the executive branch in check. The separation of power into the three branches is the foundation of a democratic system. Yet, in Japan, the ministries of the executive branch both make and implement policies. There is something wrong here. The functions of governance are not working. Recently, courts have ruled that the malapportionment of electorates when the ratio of the most populous to least populous district is 1:5, is unconstitutional. Yet, lawmakers have not done anything in response. Both the public and the legislative body had accepted the ratio of 1:3 and 1:4. The judiciary has been weak and the legislative body has not dealt with it in a responsible manner. Please think about why this is so. My hope is that you would consider my comments and take action to push lawmakers, who you have elected into office, to implement the recommendations by NAIIC. Such awareness and behavior is one of the key fundamentals necessary to make Japan’s democratic system work (in Japanese). It is now the fourth or fifth year since the start of Global Entrepreneurship Week (GEW) (1). People from over 120 countries across the world have come together for the week of November 12-18th, to celebrate, support and network with individuals who are full of entrepreneurial spirit. The Kauffman Foundation has played a central role in leading this event, which supports worldwide innovation and the spirit of entrepreneurship. I have also been involved from the start (1, 2, 3) and this year my organization, Impact Japan, is the host for the event in Japan. This year, the opening ceremony was held on November 8th, earlier than in past years in order to allow for more events and presentations. It was held in the Creative Lounge MOV in the “Hikarie” building in Shibuya. Many hard-working entrepreneurs and supporting organizations came, with perhaps sixty percent of them being Japanese. I had the opportunity to talk at the opening ceremony and spend time with the enthusiastic young entrepreneurs. As the event went into full swing and neared the end, Ambassador John V. Roos arrived. Taking time out of his busy schedule, he gave a speech, emphasizing the importance of “the entrepreneurial spirit and innovation” and provided many kind words of encouragement and support. 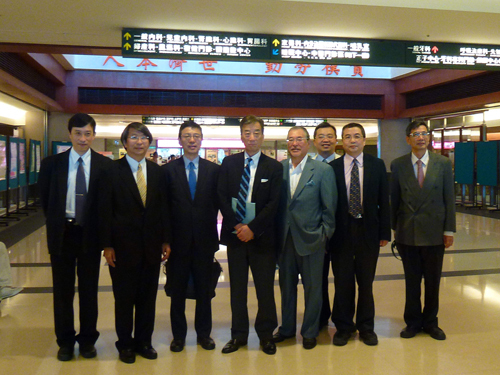 The next day, I departed for Taipei for a gathering at the Chang Gung Memorial Hospital, which I had promised to attend. I encourage you to please support the efforts and activities of the rising young entrepreneurs and Impact Japan.